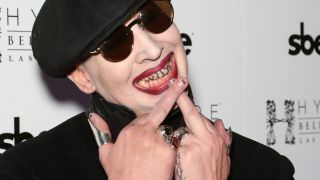 Marilyn Manson says he drew on the influence of the blues for the first time on latest album The Pale Emperor. Manson researched the story of legendary German character Faust who made a pact with the devil’s representative Mephistopheles. The story inspired the tale of blues icon Robert Johnson selling his soul to the devil in exchange for musical prowess. Asked what he’d done differently on The Pale Emperor compared to earlier records, Manson tells Loudwire: “Maybe partially learning the whole point of the blues on the record. One part being about the story of the creation of the blues with Mephistopheles and Faust, and making a deal with the devil to become a rock star. “The record has me singing in a blues range, which I’ve never done before. The blues to me came way late in the game and it was more about you telling your story – but you’re telling your story in a way that everyone who hears it is sharing the story with you so they’re going to hear the story differently. Meanwhile, footage of Manson’s performance at the Rock Am Ring festival in Germany last weekend has been released and can be viewed below. Manson will headline the Zippo Encore Stage at Download on Saturday (June 13) and then tours North America alongside the Smashing Pumpkins.